I recall Stanley Hauerwas at Duke using the example of brick-laying to illustrate the nature of tradition. It is a skill that can be taught up to a certain point – but finally can only be mastered by working with a master brick mason. It is a skill that is “handed down.” In point of fact, most human learning has something of this element. You go to high school and college – perhaps even graduate school. However, once you find yourself in the world of work, having to apply things that have been learned, tradition becomes essential. Theory and practice are separate experiences. My father received training as an aircraft mechanic during the Second World War. He became an auto mechanic after the war. The training was somewhat transferrable. His father was also a mechanic – but one who had no training. He learned by experience and the tradition that is the practice of being a mechanic. Both were very intelligent men and quite skilled in their field. But they knew things that were never taught in school. We learn to cook in the same manner – a recipe never being sufficient of itself. Such examples could be almost endlessly multiplied. It is essential to human life and always has been. The Christian life is no different – for it is not a set of ideas to be memorized – but a life to be lived. For this reason, Christ had disciples. For this reason the Church had a catechumenate that often lasted for three years. We learn the Christian life by doing it. We learn to pray by praying and praying along with those who know how to pray. We read Scripture with those who have read it before us and from them we learn how it is that a Christian reads Scripture. Those who have not been trained in such a manner are like children building a house with bricks. They may have the proper ingredients – but the result is likely to be a house that falls down. Modernity has an assumption that those who live in the present always know more than those who have gone before us. Thus we always expect our children to be able to program a digital clock when an adult cannot. I have taught four children how to drive. It is a tradition. Over the years I hope to have taught them how to live the Christian life. It is a tradition. To learn from a tradition requires a humility and a recognition that not everything worth knowing can be expressed in words. It requires that we accept that a disciple is not greater than his master. The child is not greater than the adult. I have been a teacher of literacy and I now teach literacy teachers. We have a saying in our tradition – “A love for reading is caught, not taught”. Your post reminded me of this saying, but also made me think about the necessity of loving tradition in order to learn to live tradition (or loving the person who is sharing the tradition, or being loved by the person who loves/lives the tradition). This saying is not intended to set up a false dichotomy – direct teaching of theory/skills vs contextualized practice – however it does highlight something quite ‘magical’ about the process, something beyond our control and yet within our grasp. Thank you for this helpful and thought provoking post! I love the picture… and this post. I try to explain tradition but always fall short. THANKS! Father, I have learned much from your blog, and I have struggled for a long time with the decision, if it is that, to become an Orthodox Christian. It is because of what you wrote in this post that I have not yet made that decision. It is a daily struggle for me, because I have received so much from my own teachers and pastors. I have also received much from the fathers of the Church and other Orthodox Christians, including yourself through your own posts. 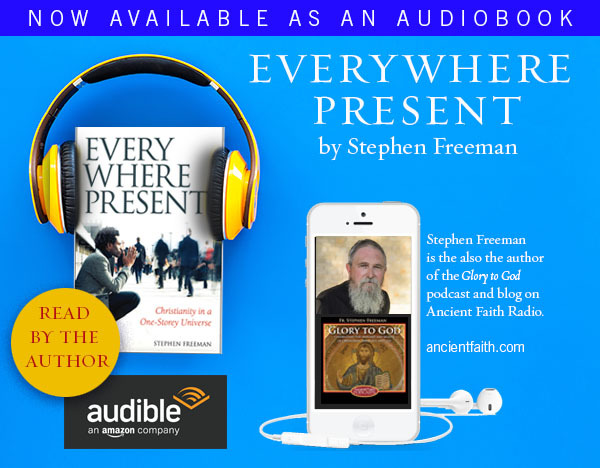 How do I give up everything I have received throughout my entire life for another tradition, even if I have come to believe that Orthodox Christianity is that tradition which is the true, apostolic tradition? As one who has come through the other side of that decision, for me, it has not been essentially a matter of giving things up. I see it as being a fulfillment of all that I was taught and given. This was a struggle for me too, as there was much that was rich and good in the traditions in which I was brought up. I had thought initially that joining the Orthodox Church would mean denying the good in my history. While there has been considerable sifting through of old ways of thinking about and living the faith (and more sifting and sorting to do), I don’t feel a sense of denial of all that came before, but of integrating that history into a new whole. It took awhile to come to this sense though. Sandra, having left behind different Christian traditions as well to become Orthodox, I am very conscious of having been led to this place as much because of the truth and examples of faith I have received from others outside of the Orthodox Church as I have been compelled by an attraction to a fullness within Orthodoxy I could not find anywhere else. ISTM that the goodness of God means that anytime someone seeks Him with sincerity, the Holy Spirit acts and imparts grace and wisdom to the extent that person is willing to receive it. I think it would be correct to say that this, too, is a manifestation of the Tradition. Insofar as there are beliefs, attitudes of heart, and practices upheld by Christians outside of the Orthodox Church that are in agreement with Orthodoxy, there is something of the Tradition there as well (just not in its completeness). ISTM that becoming an Orthodox Christian can be as much a fulfillment of the best that you have received from your non-Orthodox Christian background as it is a repentance from what within those traditions ultimately runs counter to the Tradition in its fullness. Thank you as always Fr Stephen. Your reference to the 3-year catechumenate makes me wonder how you proceed with inquirers and catechumens in your parish church. My Orthodox godparents and I were taught individually by a priest and felt blessed to have our instruction be tailored to our spiritual state (which apparently was the case in the pre-Vatican II Catholic church as well. Recently our parish started having group classes taught by a deacon to foster a sense of community among newcomers over a specified period somewhat like RCIA post Vatican II classes. Just wondering about your thoughts and mode of teaching Thanks! These last few posts have been like a mini catachesis for me. Thank you for your reflections. GREAT job on describing the importance of tradition in the Church. I always grieve for people who have no use for tradition, regarding it as a set of meaningless rules, or worse, something handed down to perpetuate the “power” of “patriarchal restrictions on women.” Thanks, Father! Thank you Father Stephen for this post. I look back with a bit of chagrin at my question in one of my first classes asking for a list of traditions and being told one cannot list them. Further study and reading have shown me the role tradition has played in handing down person by person and generation by generation our Christian life. As to the question of leaving one body of Christians for another, which I have done very recently into Orthodoxy, I would suggest that perhaps the best way to look at this is to think about where God wants us to be. When we turn our lives over to him, we have to learn to think about where He thinks we should be not where we think we should be. Where do you want me to be, God? is the question to ask. He deploys believers where He needs them. Is there an Orthodox Christian oral tradition which provides biblical background details analogous to that of the Jews? I’m thinking of things such as the fact that Isaac was in his thirties at the time when he was brough up to be sacrificed by Abraham, which I have heard from both a Jewish rabbi and an Orthodox Christian priest. If so, where can we find these details? 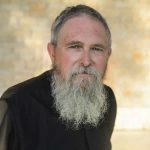 Recently you made a comment with respect to Trinitarian doctrine to the effect that for most western Christians, if God were viewed as a simple unity as in the other monotheistic faiths such as Judaism and Islam, it would not greatly affect their approach to Christian life and ministry, but if that were to happen in Orthodoxy, it would undermine the very foundations of our faith. I have been looking for that reference without success. Do you perhaps remember where this was (or what you said)? Please I need some insight about the difference between will and feelings. Sorry I cannot discern. I found myself so easely entangled by my feelings I am afraid they define me. And also it is difficult for me to understand how the human identity differs from both memory and feelings. What happens to a person like myself whose memories are quite troubling and whose feelings resort lately to sadness and anger. I fight so strong against them and eventually it seems I win. But I found myself distrusting my will because even when deciding to look at life with hope it seems to me this “willful decision” has “lesser value” that the ever-present landscape of rebelious feelings. Karen’s question reminded me of an aspect of Tradition that I often reflect on. We cross ourselves a lot in Orthodoxy. There may be rubrics written somewhere for this but mainly we learn how and when to do so by Tradition, by observing and doing. This simple yet profound act is a constant affirmation of the Trinity as well as of the Cross and our devotion to Christ. Most protestant groups have lost this traditional practice, and I believe it is not coincidental that many have also lost a firm grip on Trinitarian doctrine. By cementing doing and believing together into a seamless whole, Tradition preserves the Faith once for all delivered to the saints. As a male unmarried convert (who is also painfully shy), I accept the point of this post but it makes me want to scream. My parish is overwhelmingly ethnic and made up of families with children. The entire life of the parish centers around passing the faith and the culture on to the next generation, which is commendable, but which doesn’t include me. If I submit to the purgatory (sorry, toll-house) of “coffee and donuts,” people are polite, but after being a member of this parish for a couple of years now I still feel like a visitor. And the other Orthodox parishes in the area I’ve attended are more or less the same. I have a good prayer rule to which I adhere and I attend the liturgy every Sunday and when I am able on feast days during the week. But if Orthodox is a religion that you learn to practice by being part of a community then I am afraid I will never be Orthodox. Balance within the Orthodox faith is key. traditions pass to those new to the Faith from those born to the Faith, alongside insights drawn from those with varied Christian backgrounds – this brings a richness to Orthodoxy. This is a new stage for Orthodoxy in America. Dice it up however you want, but this is what you’ve got . . . and stirring it all together takes effort and awareness from all sides. Geography plays a role in all this, particularly in America. In the South, parishes are often heavily convert and more or less easily adopt new members. It’s harder in other situations. Being painfully shy increases the difficulty. Your priest or confessor should be a primary help. Part of the problem, it seems to me, is that apart from the celebration of the sacraments, the principle function of most Orthodox parishes is social and cultural rather than religious. For example, at my parish, there is a once a week Bible study conducted during the week, when most people are at work. That suggests to me that it is primarily for retirees who need something to do. There is very little in the way of adult education and with respect to what exists I get the sense that the classes and lectures are primarily an excuse for people who already know each other to meet and socialize afterwards. I want to make friends, but I would like the basis of the friendship to be the Orthodox faith rather than my kids or my Arabic surname (and I don’t have either). You mention speaking to my priest or spiritual director. My parish has two priests who from what I can see do most of the work for a large affluent parish. And since I work even scheduling an appointment to see a priest for more than fifteen minutes is difficult. I love the Orthodox faith and I’m not going anywhere but there don’t seem to me to be any obvious solutions. I feel a bit like you do already. I only recently began attending an ethnic Orthodox church in the next city. I am fortunate that there is one. I try to remember that. There is much it seems that I may never feel at home with there. But much that I do. I am thankful for the latter. The latter may be enough. Parish experience varies widely. Thus we can’t say “most Orthodox parishes” based on the experience of a few. Tradition is a thorny issue for us moderns – it is often thought of as to merely deal with what we deem to be non-essential, arbitrary or unimportant – such as dress codes, liturgical rubrics, titles and so forth. So we ignore, change or discard at will. But this overlooks the central issue regarding Tradition which is one of utmost importance to Christians – authority. Someone asked earlier, “why do you take the body and blood passages literally and not the cut off the hand/foot texts?” – and we can respond with various reasons that seem right and “make sense” to us. There is certainly nothing wrong in exploring these and other questions. But for Orthodox Christians, however, the answer ultimately comes down to Tradition, a living Tradition which we believe is the witness and work of the Holy Spirit Himself. Our faith is in the Living God who works in His Church throughout the ages. By rejecting Tradition we reject God Himself. I’m sorry, Father. I didn’t mean to make you defensive. When I spoke of most Orthodox parishes, I was of course referring to my own experience and to the experiences of those Orthodox people I have known. I have no other basis for judgment. Fr. thank you for this post, it is very thoughtful. With your permission I would like to use it in our monthly Bulletin if you don’t mind. I have spent most of my Orthodox time in a middle eastern church. They seem to be nice folks but never seemed to interested in learning my name. So I learned their’s and it freaked them out a bit when I approached them and called them by their name. I still have a hard time pronouncing many names and in when I see them in written form, I’ve got no chance. I’m in an accepting mode and have decided that the food is excellent and the sacraments are even better. Hang in there dude. It can be hard to learn to love those around us. Sometimes the most difficult people we encounter are our brothers and sisters in Christ that comprise our home parish community. Many prayers for all who find themselves feeling adrift. Perhaps I can address the difficulties of bridging cultural differences, since I’m of Middle Eastern descent (although I’m born and raised here in USA, and frankly some Arabic culture still puzzles me). First, I agree there is a huge social component at Church, which I often struggle with as well (yep, it’s the truth). When I’m at Church, I’m there for Church, and when I’m at the various other spots my life takes me I’m a chatterbox. But I’m at Church for Church, and not best friends, coffee, or much else. So sorry to admit, but because I attend Church with some folks they may be an odd bunch and we have Church in common and perhaps not much else. But, the big difference for me is I have a huge (HUGE) Orthodox family and it provides a huge (HUGE) community of Orthodoxy, although not in the same town as me. But I’ve always felt Church is a place of Worship, the other bells and whistles are extras. In fact, I love attending various Churches where I can slip in the back unnoticed and worship in wonderful anonymous peace. Forgive me for my ramblings . . .
Just to be up front about my background, I’m Protestant, although I’ve been looking at Orthodoxy quite a bit in the past several years. This is a great post on the need for tradition, but I don’t know if it sufficiently deals with the fact of innovation. One might even say the need for innovation. Teaching your children how to drive was an interesting example, because though it is a tradition, it is not a very old one; it is based on an innovation that is hardly more than 100 years old. The “always” in this assumption is plainly wrong, for reasons I can agree with you on. But the following statement is a fact, not an assumption: newer generations can do some things that older generations couldn’t. Of course we must give credit to older generations for passing down their knowledge to us, or else we wouldn’t be able to come up with new innovations. It seems to me that innovation is part of any robust tradition. I celebrate the fact that the Protestant tradition of which I am a part can look back at the traditions which got us to where we are, yet always have an eye on how to refine these traditions or apply them in new ways. How do the Orthodox view innovation? Is it part of the tradition? Does each individual have a part to play in moving the tradition forward? Orthodoxy does not see Tradition as an artifact of human culture. It sees Tradition as the living presence of God in His Church. 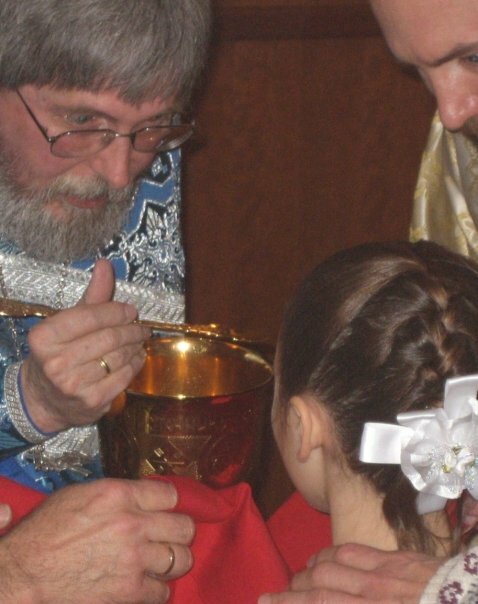 You may be a convert, and I certainly sympathize with your situation, but one thing is certain: if you are communing in the Body and Blood of Christ as member of His Body, the Church, you ARE an Orthodox Christian. It is not a question of whether you’ll ever be one; you already ARE. Sure, you may have much to learn or unlearn. Who among us doesn’t? I’ve been a convert for many, many years. I, too, am somewhat shy and often feel like a visitor even among those I have come to know well. And I’m still learning and unlearning on the level of the heart. Sometimes this occurs in prayer, sometimes by the silent leadership of holy people, other times by merely being attentive to how the hymns of the Church reveal her understanding of Scripture, as well as countless other ways including this blessed blog which has corrected me on many occasions. It is often a painfully slow process. But just as a child is fully human and fully a member of the family at conception while he also grows and is nurtured within the family , so all those baptized into to Christ have put on Christ in His fullness while also having the unlimited capacity for growth into the likeness of God as sons in His family. You ARE an Orthodox Christian and a full participant in the Living Tradition of the Church. This post reminded me of the song Tradition from Fiddler on the Roof. I have tried to think about the meaning of the word discipleship, a word that is thrown about rather casually in most Christian circles. I think the word is misused. Discipleship has nothing to do with most of what goes on in an American church. Actually, I think the word as it should be used, describes the relationship between instructor and student in a traditional marital arts environment. If we consider the Mideast and the model of Jesus, we see an itinerant preacher/spiritual master select a number of students, disciples. He then over the course of several years transfers a body of knowledge and power to his pupils. He does this by verbal instruction but more importantly, the students and the master live together, eat together, sleep together, and practice together. It is more than any structured learning experience, the master and the student share a life. It is a dangerous relationship. The master has so much power in this relationship it can be misused. The student has invested so much emotional energy in the master that any sense of betrayal can have cataclysmic lifetime consequences. It seems to me that the disciples of Jesus really didn’t get the “verbal instruction” even up to the end. What seemed to really get them to a new level was the resurrection as they had pretty much cut and run when things got dicy, i.e. Jesus’ arrest and death. So much for attained knowledge. But when the incarnate God came forth from the grave and reclaimed the world there was a huge shift in understanding. By the way, who is Steve? Before the resurrection the seventy returned again with joy, saying, Lord, even the devils are subject unto us through thy name, but I must agree that when God incarnate came forth from the grave there was a huge shift in understanding. Steve would be the author of this blog, a good and holy man who I have been privileged to know and call friend for about 38 years. That’s a good point regarding the seventy and their pre-resurrection experience. I guess I would add that it wasn’t knowledge that got them “jacked up” but rather the demonstration of power of Jesus given them by proxy that stirred them. Yes, that Father Stephen. I’ve not had the chance to meet him but appreciate his humility, gentleness and wisdom. After recently being drawn into the Holy Apostolic Catholic Church I humbly refer to him as Father Stephen out of respect and his divinely appointed assignment. Have a great day brother Henry. America is a melting pot society in terms of religion and culture; Orthodox Christians have traditionally shared both their religion and culture. Being Orthodox Christian was just part of who you were – another layer of skin, or integrated into your heart. Thus the whole family sense within The Church. Understanding tradition is essential to Orthodoxy, though American traditions for Orthodoxy are in a state of flux. Americans somehow have a way of *improving* most of what they tackle – maybe franchising it in a mass market manner. Move slow, be patient, and handle with care the traditions of the past, because now we share our American culture. There is an important distinction between Tradition and tradition(s). It’s getting all mixed up in the discussion. Truly this is a difficult subject. Tradition, as Fr. Stephen pointed out is “the living presence of God in His Church.” Therefore it is not a set of rules. Neither is it a specific set of behaviors. However, we are not free to change it at our whim or for our convenience, it should change us as we internalize it. The issue of the American spirit of ‘improving’ everything can be a difficulty. Writing to at least resonate/commiserate with Rob the “unmarried convert’s” comment. I’ve been a practicing Orthodox Christian, by God’s grace, for about 25 years. I still feel somewhat isolated, having experienced a variety of parish disintegrations, jurisdictional battles, etc., etc. ; plus the bare fact of there not being a whole lot of parishes to choose from, if one is Orthodox. I’m not sure. When a particular way of belief — even Orthodox belief — fails to illuminate, or discover, any kind of real community in a physical sense, how long can one hold onto Truth before that itself becomes a bare idea? One does want a community that is open, friendly, and with at least one or two people that one might want to socialize with outside of church. Is there something wrong with that? Could one be faulted for actually looking for that kind of community at the expense of what others might call “truth”? Very helpful artcle, Father Stephen! I think this understanding of tradition is either misunderstood or missing in our society. Intentional, physical community is rare in the Orthodox world in the U.S. in my experience. It does occur BUT, the ones I’ve seen are either formed after the old world family/village model. It is difficult for converts to integrate into these types of communities or folks who have converted largely intact from another faith tradition of some sort. It is nice, but I am coming to believe the longer I am Orthodox, secondary. The real community is in and through the Eucharist. It connects us to one another in a real and vital way across time and space even when it goes largely unacknowledged. It is participated in by participating in the fundmental disciplines of the Church: prayer (corporate and private), fasting, almsgiving and repentance. To seek the first type of community at the expense of the second would be a grave mistake IMO since it is largely ephemeral even when it is really good. The Truth is, after all, the person of Jesus Christ–union with Him is eternal and unlikely to be experience outside the Church (especially once one has been baptized/Chrismated into the Church). To work within the second to create a sub-community that includes others who are non-Orthodox (perhaps) is not a bad thing. Family is still the core community whether it is natural, adoptive, or created by other means such as evangelizing (not proseltyzing); shared interests with friends, etc. To create such a community where one is not given takes effort–going beyond oneself and one’s comfort zones. It necessarily includes empathies other than faith. Thank you to all those who have responded to my original comment. Part of the irony of my situation is that I left a church where I felt a lot less lonely than I do now in order to become Orthodox. But returning to my original communion is not an option because regardless of the problems I am in love with Orthodoxy. (Some days I’m not so crazy about God, but I’m in love with Orthodoxy.) But I am deeply aware that it is difficult to practice Orthodoxy alone. Fasting and almsgiving it seems to me are easier to practice in the context of a community than alone, even if the community is only a couple of close friends. I am not very good at making myself do things I don’t want to do if I am doing them alone. At this point I just keep repeating my favorite Orthodox prayer (the one that includes the phrase “whether I will it or not, save me O Lord”) and hope that the Lord has a high tolerance for spiritual mediocrity. Ron, I was struck by the way you described days when you may not be crazy about God, but love Orthodoxy. I’m not Orthodox and it’s still not at all clear to me if there’s a time when I will be or not. But I find again and again that the Orthodox describe the God who eventually drew me into Christianity. I suppose I am “crazy” about that God. At least I have been drawn to him in ways that broached all my defenses. But I’ve not really found anything “new” in Orthodoxy. Instead, I’ve discovered a Christian tradition that again and again describes the God I encountered. Fr. Stephen’s post to the memory of Donald Sheehan was the first time I knew of anyone else who prayed the Jesus Prayer before they even knew it was a prayer tradition or anything about Orthodoxy. I find Orthodoxy compelling, but only because they actually describe the God who drew me to him. So I would tend to say the opposite. I’m crazy about God. Orthodoxy (or specifically the prospect of becoming Orthodox) presents … problems. Pray for the members of the church. Pray for them like it’s your job. Because it is. You will discover that the people are beautiful and are just trying to get along in this world and aren’t really trying to out-Greek you or out-culture you. It’s just all they know. It’s not a den of lions. They are there for your salvation. Be courageous and don’t be afraid: you’re just as Orthodox as anyone else. I speak as one who recently left a very friendly OCA parish for a not-as-friendly ethnic Greek church. It’s not easy, but anywhere can be heaven when you’re Orthodox. Psalm 85:11 pretty much sums up the true definition of spiritual excellence (In The Orthodox Study Bible: “I will give thanks to You, O Lord my God, with my whole heart . . .”), as exemplified by the “Eucharistic” offering of the poor widow in Mark 12:41-44. A few years ago i moved to a new town and started looking for a new church to attend. I am Protestant and in my mid twenties and I realized that I had no interest in looking for a church with a pastor past his thirties. I wanted a church that was young and thought about and understood the world like I do. However, i began to realize how unbalanced and arrogant my thinking was that i couldn’t be taught by those who came before me. At the same time I was attending seminary at an evangelical school. I was getting teaching across the Protestant spectrum and became more and more frustrated that it was up to me to pick and choose what i thought was right from the many perspectives. So many disagreements and everyone was basically just figuring it out as they went along. New innovations in theology such as open theism were supported by some and deemed heretical ny others in the school. The defenders took pride that the reformers were once called heretics too and searched for evidence of historical groups with similar beliefs that had been “squashed” by the church. i began to feel like Protestantism was lacking any legitimate authoricenters center to hold it together. I began to look back to try to find a center or authority and began to discover the orthodox church. I asked professors for more information about the eastern church but they could tell me very little. So i looked myself and began to read and discover. The Tradition of the church was exactly what i was looking for and found missing in Protestantism but is also still something that gives me great difficulty in seeking. I am not orthodox yet for a number of reasons but I hope to be someday. Now I still struggle with the tension between tradition and innovation. There’s a lot of tension in Protestant churches between holding onto traditional forms of worship and innovating to keep up with peoples preferences and cultural understandings. Orthodoxy doesn’t struggle with this issue so much because it has a respect for tradition yet there has been innovation in worship as orthodoxy has moved into new cultures. Such as western rite liturgies. Is the church just slower to innovate than protetant churches and does this fear of innovation create a safety mechanism? Do the option of church splits and lack of authority structure in Protestant churches create easier innovation? Will orthodoxy slowly take a “more western” feel of worship in America? Is this even possible? The more I understand about orthodoxy the more i think it cannot be understood from any sort of western cultural understanding. Orthodoxy is still examining the “Western Rite” but does not yet have a real consensus on the matter. It is not seen as a necessary accommodation to Western culture. The liturgy does undergo some evolution over the centuries, remaining faithful to what has been received. Orthodoxy will doubtless have some things about it that are uniquely “American” as it takes root in our culture – but I seriously doubt this will be marked by huge innovations in the liturgy. I certainly pray that there will be no such innovations. Alex, sorry. The question got sort of buried. There is no single source on such items of tradition. The fragments of Papias have some interest. The History of the Church by Eusebius also has a fair amount. Generally, it’s scattered across a lot of material – mostly patristic writings. I am not aware of any one place that gathers such things up.